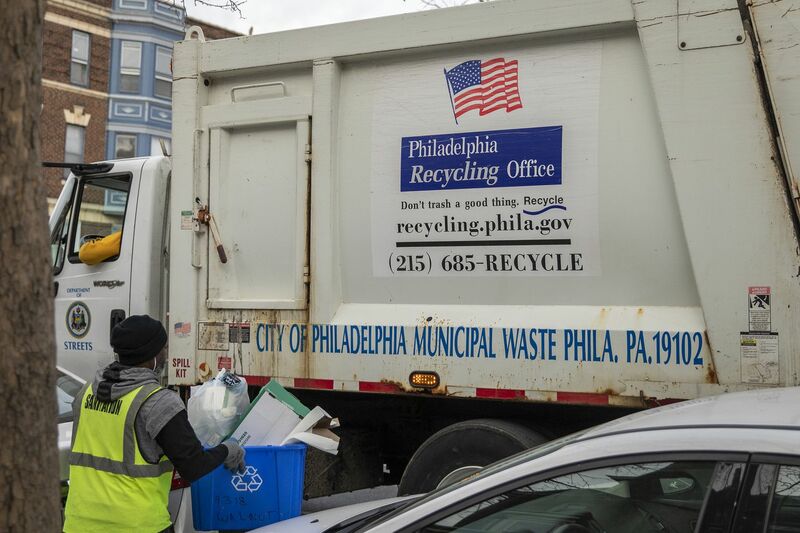 Recycling is collected on the 4300 block of Walnut in West Philadelphia on Wednesday, Jan. 23, 2019. Half of the recycling pickup in Philadelphia is being incinerated. To reduce waste, efforts should go beyond recycling to reduce plastic use altogether, the authors say. Berkeley, CA recently passed a law that moves us a step closer to that, and it’s something that should be replicated across the country. The ordinance does not simply ban plastic foodware, leaving businesses to replace it with other throwaway materials: It rejects throwaway culture altogether. Beginning immediately, Berkeley will require that accessory items such as utensils, straws, lids and sleeves be provided by request only and that food vendors have compost bins for all customers. In January 2020, the city will also require that all disposable takeout foodware be Biodegradable Products Institute-certified compostable and that vendors charge 25 cents for hot and cold takeout cups. If a customer brings a reusable cup, the charge is not applied. By July 1, 2020, the ordinance will require that all eat-in dining be on reusable foodware. But we need to be more realistic about the kinds of plastic that can be effectively collected, processed and then reused. Single-stream recycling, which co-mingles different materials for collection, is convenient, but it leads to increased contamination. Annie Leonard is executive director of Greenpeace USA. Martin Bourque is executive director of the Ecology Center, which launched the nation’s first curbside recycling program. A version of this piece previously appeared in the Los Angeles Times.